About 13 years ago, I sat in my 11th grade Spanish class struggling to keep my eyes open. I was tired, having worked late the night before. After coming home from work, I spent an hour or two on homework before I hit the bed, maybe around 12 a.m. Then I was up no later than 5.30 a.m., so that I could be out of the house by 6.30 a.m. or so, and in class by time the bell rang at 7.20. So I was tired, you see. I think I even fell asleep, which was a shame because I really enjoyed this class. We were reading ‘The House on Mango Street’ by Sandra Cisneros in Spanish which I loved. Because I wasn’t fluent in Spanish, I kept a copy of the book in English so that I could understand the storyline a little bit better. It wasn’t a long book and I found it incredibly honest and funny. For some reason, I identified with the main character Esperanza who wasn’t very fond of her neighborhood. I didn’t like mine either; in fact I hated the whole dang city. 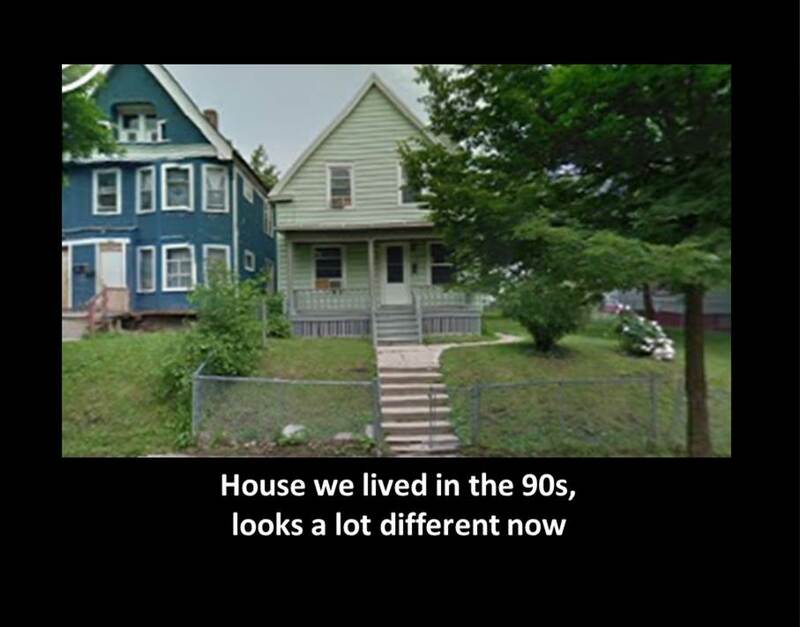 Growing up in Milwaukee in the 80s and 90s was rough. For the majority of my childhood, my family lived on 37th and Lisbon. Our house got shot up so many times I have lost count (by the grace of GOD we all survived). Hitting the floor became a custom that we were all too acquainted with. I learned to despise holidays like New Year’s, which in my neighborhood triggered more shooting. It was so bad that whenever my youth pastor would drop my sister and I at home after youth group on Wednesday nights, he wouldn’t wait for us to get into the house before he pulled off speeding. One time, my friend’s father was dropping me off at home after church on a Sunday afternoon and cop cars filled our street. He decided that we should go out to eat until whatever drama filled 37th Street passed. When I was 15, my family moved to a slightly better area of the city. Slightly. No, our house wasn’t getting shot at anymore, and I did feel a bit better about moving through our neighborhood without looking over my shoulder every second but only if I stayed within a few blocks. For years, I had reoccurring nightmares about getting shot. I don’t think they stopped until I came to college. Honestly, I didn’t think I would make it to college with all of the violence and madness that we lived through. Friends and family members got shot or shot at on a regular basis, some were blessed enough to live to tell about it. Others not so much. I promised myself that as soon as I was able, I would run like hell from the literal hell that I lived through almost every day. I had no intentions of ever coming back. “Esperanza. The one with marble hands called me aside. Esperanza. She held my face with her blue-veined hand and looked and looked at me. A long silence. When you leave you must remember always to come back, she said. When you leave you must remember to come back for the others. A circle, understand? You will always be Esperanza. You will always be Mango Street. You can’t erase what you know. You can’t forget who you are. Then I didn’t know what to say. It was as if she could read my mind, as if she knew what I had wished for, and I felt ashamed for having made such a selfish wish. When I read these words back in the 11th grade, I was horrified. I resisted. I didn’t want to ever, ever go back to Milwaukee, or in fact, anything remotely close to what Milwaukee represented. I wanted to escape, not because I was ashamed of my city but because my city had caused me so much pain. And so I came to the Twin Cities for college, only going back home one or two times a year at the most. I visit for just a few days and then I quickly run back here where it’s nice and safe and secure. I attended North Central University, a small Bible college in downtown Minneapolis. While many of my friends were majoring in Urban Studies or Youth Development, I took up Pastoral Studies and Missions so that my ministry work would take me some place exotic, even further away from the spaces and places that I didn’t want to be. After North Central, I went to Bethel Seminary to earn a Master of Arts in Global and Contextual Studies, a fancy way of saying missions. While studying I took a missions trip to Africa and got even more excited about doing ministry in some far off place that didn’t have the hoods that had been a part of my life. I wanted to be safe. And I wanted my children to be safe. I didn’t want them to experience half of what I did, and I definitely didn’t want them to experience anything worse. But what about other people’s kids? In “Deep Justice in a Broken World” authors Chap Clark and Karen E. Powell interview Jim Wallis and ask him about his own commitment to justice. Wallis says, “Because we’re all made in God’s image, a kid living in a garbage dump in Mexico is just as important as my own kid…what has got to motivate me is that other people’s kids are just as important to God and to me as my own kids.” (page 58). A kid living in a drug house on 37th and Lisbon in Milwaukee has got to matter to me just as much as my own kids living in a comfortable apartment in Roseville. I’m not exactly sure where this leaves or rather leads me. But God’s timing couldn’t be more perfect. As my husband and I prayerfully look for vocational ministry opportunities, Cisnero’s words ring in my spirit: You must remember to come back. For the ones who cannot leave as easily as you. You will remember? Go back. To breathe life into the city. To prophesy over the city. To do good and justice in the city. “Like it or not you are Mango Street and one day you’ll come back too. Not me. Not until somebody makes it better. Who’s going to do it? The mayor? And the thought of the mayor coming to Mango Street makes me laugh out loud. Who’s going to make Milwaukee or any other city with its complex problems better? It has got to be me, and the people of God and the people of the city standing in solidarity to make it better. Together, we are called to do deep justice and right the wrongs that have caused places like Milwaukee to even exist. Together, we speak against racism and ugly housing policies that force people of color into certain neighborhoods and out of others. Together, we call out police practices that target our young men and leave our children fatherless. Together, we create jobs and other entrepreneurial opportunities that pay a living wage so that no one has to get dinner from McDonalds. Together we make it better, together we make a difference and bring a little bit of the kingdom of God to earth right now. Not ministry from a distance. Not ministry so that it makes us feel good and safe and secure. But ministry that causes us to sacrifice and live a little with gratitude because of everything God has done for us. Because remember, we once were that city. We once were dead and decaying. But God called us forth out of the dead and breathed life so that now we live. I wanted to take time out to let you know how much i appreciated this blog post. I never thought i would be living in Milwaukee at this point in my life but God had different plans and has changed my heart. He is continually sharing His hope over this city and i believe like you said it is up to His church to speak life and aid in change. Thank you again for sharing. It moves my heart to hear people from Milwaukee share about their experiences and what God wants to do. May you and your family be blessed! Thank you for your blog post about Milwaukee. When people who have lived here share their experiences and what God wants to do it blesses me so much! A few years ago i would have never thought i would be living and doing ministry in Milwaukee. But God has changed my heart. He has given me hope for this city and just like you said I believe He wants His church to rise up and do something about all the struggle happening in the city. Thank you for the encouragement about this city and for sharing your own experience. May you and your family be richly blessed! Sorry i thought the first one didn’t post. No worries. And thanks for sharing your story and struggle. Unfortunately, my family and I live in Minnesota right now. As we figure out where God is calling us to vocational ministry, Milwaukee just may be an option. We just want to be open and willing to go wherever His Spirit leads us – no holds barred. But thank you so much for the invitation. I am actually an urban studies major at UWM and the largest emphasis is placed on Milwaukee. So my whole major is learning about these things and is interdisciplinary. I am currently taking a class on race relations and Milwaukee comes up almost every class. Thanks for the insight, being informed is so important and knowing these things allows them to be brought into the light which is so important as well as praying for systemic change and give it all to God. I actually work at Adullam, the ministry posted above. God is changing everything in my life haha so good!